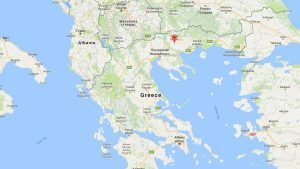 Flovac Greece has just completed the largest vacuum sewerage system ever undertaken in Greece covering the towns of Mitrousi and Skoutari in the Serres Region of northern Greece. The system which has two large vacuum pump stations, 800 collection pits and 45km of vacuum pipework. The system takes away the sewage of 3,600 residents in Mitrousi and over 4,100 residents in Skoutari. This makes it one of the largest systems ever installed in Europe. The Serres region is an environmentally important area which won a European sustainable tourism award for aquatourism. A large artificial lake, Lake Kerkini was created nearby to make use of the extensive marshlands in the area. This is also behind the need for vacuum sewers in the villages as the water table is very high and actually visible on the surface in some areas. As the vacuum sewer pipework can be laid at minimum depth and avoid de-watering is was seen as the only way in which a proper sewer system could be installed. Vacuum sewer system are also popular in Greece because of the flexibility in the laying of the pipe. On many occasions archaeological artifacts are found during the construction of a system and rather than hold up construction for weeks or months while a site is investigated, the vacuum pipework can be diverted around a sensitive area, thus saving time and money. The Serres region is known for a number of antiquities including important sites from the time of Alexander the Great in 300 BC. construction works, treatment as well as the operations and maintenance of a number of systems. Miltos works very closely With Harry Gerpinis who looks after Flovac’s interests in Southern Greece and has been instrumental in a number of significant projects including many large marina’s.